Seafood has been hailed as one of Scotland’s most-impressive export success stories. 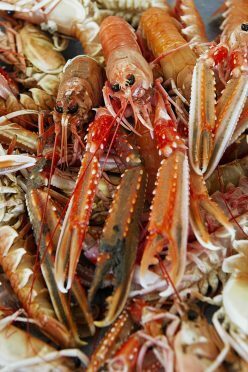 Two-thirds of the world’s langoustine are caught in Scottish waters, while exports of salmon hit an all-time high in 2014 of just shy of £500million. Yet stroll down your average supermarket aisle or peruse the menu of many Scottish restaurants and there’s a different story to be told. Fish from Chile, Norway or Vietnam grace the chiller cabinet, while many chefs keep very quiet about the origins of their seafood. Lorry after lorry leaves the North of Scotland carrying tonne after tonne of fresh seafood off to Europe and further afield. According to figures from industry body Seafood Scotland, around £1billion of seafood is caught or reared each year, with some £600million being sold overseas. Having made such a success of exports, is there more that could be done to grow the domestic market for Scotland’s seafood? “In many ways, a lot of the success story in recent years in Scottish seafood has been about international sales,” admits James Withers, chief executive of trade body Scotland Food & Drink. “I was in Singapore at the start of April with Seafood Scotland, where chefs and buyer rave about the quality we have on offer. “Our home market is still full of potential though and needs more work. The recipe for Scottish success is collaboration, with different sectors of the industry working together to develop new customers. He points to the success of “Taste Our Best”, an accreditation scheme run by VisitScotland to reward restaurants and shops that stock seasonal Scottish produce and have staff who can speak to customers about the provenance of those products. So far, more than 1,000 tourism businesses have signed up to the scheme and he says communicating with customers is key. But why have exports been such a focus for Scottish companies? For many, the relatively-small size of the Scottish market means they have had to look overseas to find a larger number of customers for their premium products, which often cost more to rear or catch. Loch Duart turns over around £30million a year, with two-thirds of its revenues coming from overseas markets, split roughly fifty-fifty between sales in euros to the European Union and in dollars to the United States, the Middle East and Far East. The company – which supplied smoked salmon for both the Queen’s diamond jubilee in 2012 and Prince William and Kate Middleton’s royal wedding the previous year, with its fish having also appeared on the menu at this year’s BAFTA Awards – exports to around 20 countries, but Mr Denton emphasises the significance of the home market. “Clearly the UK is still really important to us, because it accounts for a third of our sales,” he says. “We really value the partnerships that we’ve formed with top-end restaurants, niche retailers, and smaller smokers. When it comes to support for the industry, Mr Denton isn’t looking for handouts from ministers. “It would be easy to say that the government should ‘fund that or subsidise this or provide the other’,” he says. “But the biggest ‘problem’ that we and other players in the industry face is not creating demand but is ensuring a consistent and solid supply. “If I took the decision today to increase production then it’s likely it would be 2020 before we could do it, not only because of the extended lifecycle of our salmon but also because of the strict regulations and the time it takes to get planning permission. There are fantastic examples of individuals within the regulators or the local authorities who would bend-over backwards to help us, but the over-arching cultural position of those bodies is not so helpful. “From our industry’s perspective, what consumers could do – and they’re very silent on it at the moment – is ask for Scottish salmon in Scotland and ideally the rest of the UK,” adds Mr Denton. “If you turn over a packet of salmon in any of the major retailers at the moment then there’s a chance it will come from the Faroes or Norway or even Chile. There’s a reason that foreign salmon is cheap – it’s not grown to the same standards that the Scottish industry observes. When it comes to growing the domestic market, Seafood Scotland has a clear plan. “By far the most effective tactic is to let people taste the product,” explains trade marketing manager Clare MacDougall. That work has included organising visits for top chefs to Scotland, including Monica Galetti, Masterchef 2010 winner Druv Baker, and staff from restaurants including Le Gavroche and Gordon Ramsay Group. Events have also taken place in London, including with Masterchef judge John Torode. At the turn of the year, the organisation also worked with celebrity chef Jamie Oliver on his Jamie & Jimmy’s Friday Night Feast programme for Channel 4. “To grow the market in the UK, working with UK-based chefs has helped to drive consumer demand for seafood,” adds Ms MacDougall. “Government funding for local initiatives and consumer engagement events could help grow more understanding of the provenance and range of seafood on their doorstep. One company that’s on a mission to get more people to eat seafood is Inverness-based fish wholesaler Coast & Glen, which launched its Fishbox brand in 2011. Subscribed customers select the size of box they want and supply information about their preferences and then Fishbox selects the seafood and sends it out to them through the post, having sourced its produce from markets such as Fraserburgh, Kinlochbervie, Peterhead, Scrabster and Shetland. The company’s 1,200 customers are constantly being surprised by the variety of seafood they receive and can follow recipes cards to help them cook the species with which they’re not familiar. Being both local and sustainable, the model ties in with consumers’ appetite to know the provenance of their food.